After wining the 2013 North American Car of the Year with its ATS sports sedan, Cadillac continues to roll out new products prepared to take on the best of the Europeans. 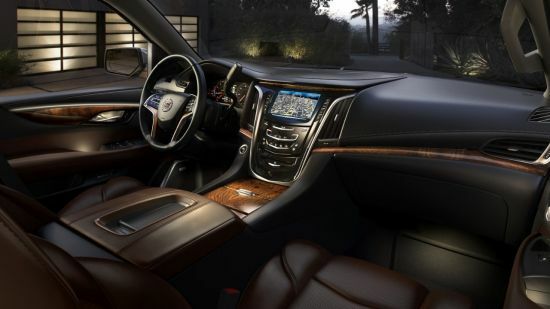 We already showed you how Consumer Reports gushed over the new CTS and now we’re giving you a sneak peak of the soon to be unveiled next-generation Cadillac Escalade’s interior. Looking as luxurious as ever, the new Escalade uses the company’s CUE infotainment system. Already in use in the ATS, CTS, XTS and SRX, CUE uses touch capacitive buttons with haptic feedback. While CUE is clearly an attempt by Cadillac to set “The Standard of the World,” we have to say we’re a little surprised to see a standard column mounted gear lever in the above photo. While there’s nothing wrong with the mechanical nature of a traditional column shifter, much of the Escalade’s competition uses more compact “by-wire” shift levers. Nonetheless, between the car’s overall size, and the apparent storage capacity of the Escalade’s center console, it doesn’t seem that drivers or passengers will be wanting for space of any kind in the all-new Escalade. Keep an eye on Red Noland Auto Group’s official blog to learn more about the next generation Cadillac Escalade when it officially debuts next week.